American Law Source On-Line (ALSO) - Comprehensive compilation of links to on-line sources of American law available without charge. See: U.S. Federal Government for U.S. Supreme Court Decisions, U.S. Courts of Appeals Decisions, U.S. District Court Decisions (including Bankruptcy Court Decisions), U.S. Special Court Decisions, U.S. Constitution, U.S. Legislation, U.S. Rules of Procedure and Practice, U.S. Administrative Law Sources, and more. Civil Rights Act of 1964 - Major features of, synopsis, and full text of the Act. Classified Information Procedures Act - "Classified information", as used in this Act, means any information or material that has been determined by the United States Government pursuant to an Executive order, statute, or regulation, to require protection against unauthorized disclosure for reasons of national security and any restricted data, as defined in paragraph r. of section 11 of the Atomic Energy Act of 1954 (42 U.S.C. 2014(y)). Code of Federal Regulations (Cornell) - This front-end to the Code of Federal Regulations (CFR) links to the most recent version of the CFR placed on the Internet by the Government Printing Office. Code of Federal Regulations (GPO Access) - Codification of the general and permanent rules published in the Federal Register by the executive departments and agencies of the Federal Government. It is divided into 50 titles that represent broad areas subject to Federal regulation. Also search for current Federal regulations in the Federal Register and Code of Federal Regulations databases at Regulations.gov. Or visit the Electronic Code of Feeral Regulations (e-CFR). Code of Federal Regulations (GPO Access:Table Search) - Codification of the general and permanent rules published in the Federal Register by the Executive departments and agencies of the Federal Government. Congressional Documents Online - A full-text archive of selected documents of the United States Congress maintained by Rutgers Shcool of Law. Constitution of the U.S. of America - Cornell Law School site presents information and resources on the U.S. Constitution. Constitution of the United States - Analysis and interpretation. Constitution Project, The (TCP) - TCP staff undertakes original research, develops policy positions, publishes reports and statements, testifies before Congress, files amicus briefs and holds regular briefings with legislative staff and other policymakers. TCP's work has been cited by numerous government agencies, as well as leading law and policy organizations. Publishing materials that bring clarity to complex constitutional problems and solutions is also a part of TCP's mandate. Consitutional Scholar Louis Fisher - Louis Fisher is Scholar in Residence at the Constitution Project. Previously he worked for four decades at the Library of Congress as Senior Specialist in Separation of Powers (Congressional Research Service, from 1970 to 2006) and Specialist in Constitutional Law (the Law Library, from 2006 to 2010. Links to his books, articles, and Congressional testimony may be found on this site. Contact the Federal Judiciary - Federal courts across the country maintain web sites that offer valuable information such as court location and contact information, local rules, and access through PACER to case and docket information. For information on the U.S. Supreme Court, go to Supreme Court of the United States. Also, information is available about the judicial system in the United States and its two different court systems at Understanding Federal and State Courts. Convention on Cultural Property Implementation Act (the Act) - Partial text of Public Law 97-446 [H.R. 4566], 96 Stat. 2329, approved January 12, 1983; as amended by Public Law 100-204 [H.R. 1777], 101 Stat. 1331, approved December 22, 1987. This is the enabling legislation for the 1970 UNESCO Convention on the Means of Prohibiting and Preventing the Illicit Import, Export and Transfer of Ownership of Cultural Property. Davis-Bacon and Related Acts Home Page - Prepared by the Wage and Hour Division, USDOL. Digital Millenium Copyright Act - A a United States copyright law that implements two 1996 treaties of the World Intellectual Property Organization (WIPO). It criminalizes production and dissemination of technology, devices, or services intended to circumvent measures (commonly known as digital rights management or DRM) that control access to copyrighted works. It also criminalizes the act of circumventing an access control, whether or not there is actual infringement of copyright itself. In addition, the DMCA heightens the penalties for copyright infringement on the Internet. Passed on October 12, 1998 by a unanimous vote in the United States Senate and signed into law by President Bill Clinton on October 28, 1998, the DMCA amended Title 17 of the United States Code to extend the reach of copyright, while limiting the liability of the providers of on-line services for copyright infringement by their users. See full text of act here. Equal Protection - The Equal Protection Clause of the 14th amendment of the U.S. Constitution prohibits states from denying any person within its jurisdiction the equal protection of the laws. See U.S. Const. amend. XIV. In other words, the laws of a state must treat an individual in the same manner as others in similar conditions and circumstances. A violation would occur, for example, if a state prohibited an individual from entering into an employment contract because he or she was a member of a particular race. The equal protection clause is not intended to provide "equality" among individuals or classes but only "equal application" of the laws. The result, therefore, of a law is not relevant so long as there is no discrimination in its application. By denying states the ability to discriminate, the equal protection clause of the Constitution is crucial to the protection of civil rights. Also see Civil Rights. Executive Order #10450 - U.S. security requirements for government employment. Executive Order #12139 - U.S. foreign intelligence electronic surveillance. Executive Order #12333 - U.S. intelligence activities. Executive Order #12334 - U.S. President's Intelligence Oversight Board. Executive Order #12356 - U.S. national security information. Executive Order #12537 - U.S. president's Foreign Intelligence Advisory Board. Executive Order #12958 - U.S. classification of National Security Information, as amended. Fair Credit Reporting Act 15 USC § 1681 et seq - Full text of rule. The Fair Credit Reporting Act, 15 U.S.C. § 1681 (“FCRA”) is U.S. Federal Government legislation enacted to promote the accuracy, fairness, and privacy of consumer information contained in the files of consumer reporting agencies. It was intended to protect consumers from the willful and/or negligent inclusion of inaccurate information in their credit reports. To that end, the FCRA regulates the collection, dissemination, and use of consumer information, including consumer credit information. See Wikipedia. Congressional Record (Bound) - 1998 to 2002. Congressional Record (Daily) - 1994 to present. Federal Acquisition Regulation (FAR) - Established for the codification and publication of uniform policies and procedures for acquisition by all executive agencies. Federal Advisory Committee Act (FACA) - Establishes the right to obtain documents from committees that advise government agencies. Federal Communications Commission (FCC) - Regulates interstate and international communications by radio, television, wire, satellite and cable. Federal Court Forms - Maintained by FindLaw. Federal Court Rules and Policies - The federal judiciary's web site on the federal rules of practice, procedure, and evidence. This site provides access to the national and local rules currently in effect in the federal courts, as well as background information on the federal rules and the rulemaking process. All proposed amendments to the rules are posted for your review and comment. You may use the site to submit comments on amendments or to suggest other changes in the rules. Federal Deposit Insurance Corporation (FDIC) - Mandated to maintain the stability of the nation's financial system. Federal Election Commission (FEC) - Administers and enforces the Federal Election Campaign Act, the statute governing financing of federal elections. Federal Funding Accountability and Transparency Act of 2006 - An act [S.2590] that requires the full disclosure of all entities or organizations receiving federal funds beginning in fiscal year (FY) 2007 on a website maintained by the Office of Management and Budget. Federal Laws, Policy & Regulations - The resources on this page include information on Federal Records Management laws and regulations that must be followed when managing government records. Federal Legislative History Research - A practitioner's guide to compiling documents and sifting for legislative intent. Federal News Service (FNS) - Provides verbatim transcripts of the complete hearing testimony of Congress committees and subcommittees; public speeches and interviews of the President; White House, State Department, Defense Department and Justice Department briefings; press conferences and statements of international leaders visiting Washington; Presidential campaign debates and more. Federal Rules of Civil Procedure (Cornell Law School) - Rules governing the conduct of civil actions brought in Federal district courts. Federal Rules of Evidence (Cornell Law School) - Rules governing the introduction of evidence in civil and criminal proceedings in Federal courts. Federal Statutes: A Beginner's Guide - Backgrounder for researchers prepared by Barbara Bavis and Robert Brammer. FedLaw - Useful legal resources for Federal lawyers and Federal employees. FindLaw: U.S. Constitution - U.S. Constitution text, annotations, search resource. FindLaw: U.S. Constitution Fourth Amendment - U.S. Constitution Fourth Amendment text, annotations, search resource. FindLaw: U.S. Federal Case Law - Search U.S. legal information, federal law and federal case opinions. FindLaw: U.S. Supreme Court Center - U.S. Supreme Court and U.S. Constitution resources, past and present. First Amendment Handbook - Published by the Reporters Committee for Freedom of the Press. Foreign Agents Registration Act (FARA) - FARA was enacted in 1938. FARA is a disclosure statute that requires persons acting as agents of foreign principals in a political or quasi-political capacity to make periodic public disclosure of their relationship with the foreign principal, as well as activities, receipts and disbursements in support of those activities. Disclosure of the required information facilitates evaluation by the government and the American people of the statements and activities of such persons in light of their function as foreign agents. The FARA Registration Unit of the Counterespionage Section (CES) in the National Security Division (NSD) is responsible for the administration and enforcement of the Act. Foreign Corrupt Practices Act (FCPA) - In 1977, Congress passed the Foreign Corrupt Practices Act to address what was perceived as open and flagrant participation in the corruption of foreign governments by United States multinational corporations. Freedom of Information Act - The full text of the Freedom of Information Act in a form showing all amendments to the statute made by the Electronic Freedom of Information Act Amendments of 1996. How Our Laws Are Made - U.S. House of Representatives document on how laws are made in the U.S. Inspector General Act of 1978 - "To reorganize the executive branch of the Government and increase its economy and efficiency by establishing Offices of Inspector General within the Departments of Agriculture, Commerce, Housing and Urban Development, the Interior, Labor, and Transportation, and within the Community Services Administration, the Environmental Protection Agency, the General Services Administration, the National Aeronautics and Space Administration, the Small Business Administration, and the Veterans' Administration, and for other purposes." International Cultural Property Protection - United States Department of State site. The State Department is responsible for implementing the Convention on Cultural Property Implementation Act. This is the enabling legislation for the 1970 UNESCO Convention on the Means of Prohibiting and Preventing the Illicit Import, Export and Transfer of Ownership of Cultural Property. In accordance with the Act, United States Department of State accepts requests from countries for import restrictions on archaeological or ethnological artifacts, the pillage of which places their national cultural heritage in jeopardy. International Emergency Economic Powers Act (IEEPA) - A United States federal law allowing presidents to identify any unusual extraordinary threat that originates outside the United States and to confiscate property and prohibit transactions in response. In the United States Code the IEEPA is Title 50, sections 1701-1707. Also see IEEPA Wikipedia entry. Legal Information Institute (LII) - Comprehensive Cornell Law School legal resources site with powerful search engine. Library of Congress: Guide to Law Online - An annotated guide to sources of information on government and law available online. It includes selected links to useful and reliable sites for legal information. U.S. Federal - Includes U.S. Code and Constitution links. LLSDC's Legislative Source Book - Law Librarians' Society of Washington D.C. resources. Meta-Index for U.S. Legal Research - Searchable legal indexes on the World Wide Web, including judicial opinions, legislation, regulations, and more. National Archives and Records Administration (NARA) FOIA - Freedom of Information Act information and links. National Constitution Center - The first and only institution in America established by Congress to "disseminate information about the United States Constitution on a non-partisan basis in order to increase the awareness and understanding of the Constitution among the American people." National Emergencies Act - Also see Wikipedia backgrounder. National Stolen Property Act (NSPA) - U.S. Code Title 18 - Crimes and Criminal Procedure, Sections 2314 and 2315. Office of Workers' Compensation Programs (OWCP) - The OWCP had its origins in an organization established in 1916 to administer claims under the Federal Employees' Compensation Act. Benefits are available under this Act to more than three million federal employees, members and the Peace Corp, Americorps, Vista volunteers. OWCP also administers the Longshore and Harbor Workers' Compensation Act of 1927. This Act covers all maritime workers injured or killed upon the navigable waters of the U.S., as well as employees working on adjoining piers, docks and terminals, plus a number of other groups. Compensation under this Act is paid by employers who are self-insured, or through insurance policies provided by private insurers to employers. Office of Law Revision Counsel - Prepares and publishes the U.S. Code, which is a consolidation and codification by subject matter of the general and permanent laws of the U.S.
Office of Safety and Health Administration (OSHA) - Mandated to prevent injuries and protect the health of America's workers. Presidential Pardons - JURIST: The Legal Education Network at the University of Pittsburgh School of Law presents this guide as a non-partisan educational resource on the law of Presidential pardons. Search the U.S. Code - Presented by the Office of the Law Revision Counsel. Social Security Rulings and Acquiescence Rulings - Old Age and Survivor's Insurance, Disability Insurance, supplemental Security Insurance, Acquiensce Rulings. Stanford Securities Class Action Clearinghouse - Full text of complaints, motions, judicial opinions, and other major class action filings into a Website with its own full-text search engine. Taft-Hartley Act of 1947 - Also cited as Labor Management Relations Act (LMRA), 29 U.S.C. Sec. 141-197. [Title 29, Chapter 7, United States Code]. Telecommunications Act of 1996 [.pdf] - The Telecommunications Act of 1996 is the first major overhaul of telecommunications law in almost 62 years. The goal of this new law is to let anyone enter any communications business - to let any communications business compete in any market against any other. Also see the FCC's 1996 Telecommunications Act page. THOMAS - U.S. legislative information provided by the Library of Congress. Search current congress for text of bills. Retrieve public laws. U.S. Attorneys Office - The United States Attorneys serve as the nation's principal litigators under the direction of the Attorney General. There are 93 United States Attorneys stationed throughout the United States, Puerto Rico, the Virgin Islands, Guam, and the Northern Mariana Islands. United States Attorneys are appointed by, and serve at the discretion of, the President of the United States, with advice and consent of the United States Senate. One United States Attorney is assigned to each of the judicial districts, with the exception of Guam and the Northern Mariana Islands where a single United States Attorney serves in both districts. Each United States Attorney is the chief federal law enforcement officer of the United States within his or her particular jurisdiction. Also see United States Attorneys' Offices Contact Information. U.S. Attorneys Manual - The United States Attorneys' Manual is a looseleaf text designed as a quick and ready reference for United States Attorneys, Assistant United States Attorneys, and Department attorneys responsible for the prosecution of violations of federal law. It contains general policies and some procedures relevant to the work of the United States Attorneys' offices and to their relations with the legal divisions, investigative agencies, and other components within the Department of Justice. U.S. Code - Generated by Cornell Law School from the most recent version made available by the U.S. House of Representatives. U.S. Code Classification Tables - These tables show where recently enacted laws will appear in the U.S. Code and which sections of the Code have been amended by those laws. The tables sorted in Public Law order may be used to identify the sections of the Code affected by a particular law. The tables sorted in Code order may be used to determine whether a particular section of the Code has recently been amended. The tables only include those provisions of law that have been classified to the Code. The text of recently enacted laws may be found through the Library of Congress Thomas web site. U.S. Code - This version, maintained by Cornell Law School, is generated from the most recent version made available by the U.S. House of Representatives. U.S. Code: Table of Popular Names - The Table of Popular Names is a list of common names for legislative acts. Where possible, Cornell law School's Legal Information Institute (LII) has linked the Popular Names item to its relevant section of the U.S. Code. 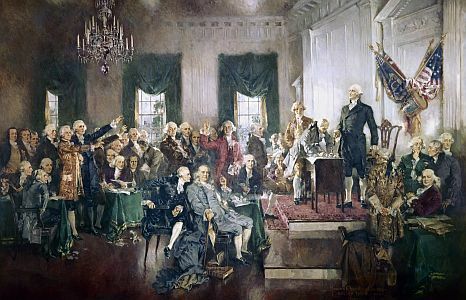 U.S. Constitution - FindLaw's hyperlinked presentation of full constitution, annotations, and amendments. Keyword searchable. Supplemental resources. U.S. Constitution - U.S. Constitution and annotations prepared by the Congressional Research Service of the Library of Congress. U.S. Constitutional Amendments - Articles in addition to, and amendment of, the Constitution of the United States of America, proposed by Congress, and ratified by the several states, pursuant to the Fifth Article of the original Constitution. U.S. Department of Justice, Office of Legal Counsel - By delegation from the Attorney General, the Assistant Attorney General in charge of the Office of Legal Counsel provides authoritative legal advice to the President and all the Executive Branch agencies. The Office drafts legal opinions of the Attorney General and also provides its own written opinions and oral advice in response to requests from the Counsel to the President, the various agencies of the Executive Branch, and offices within the Department. Such requests typically deal with legal issues of particular complexity and importance or about which two or more agencies are in disagreement. The Office also is responsible for providing legal advice to the Executive Branch on all constitutional questions and reviewing pending legislation for constitutionality. All executive orders and proclamations proposed to be issued by the President are reviewed by the Office of Legal Counsel for form and legality, as are various other matters that require the President's formal approval. U.S. Department of Justice, Office of Special Counsel: Patrick J Fitzgerald - Pursuing the case concerning the outing of CIA operative Valerie Plame. U.S. Department of Justice, Office of the Inspector General - Promotes economy, efficiency and effectiveness within the Department. The Inspector General also enforces criminal and civil laws, regulations and ethical standards within DOJ by investigating individuals and organizations who allegedly are involved in financial, contractual or criminal misconduct in DOJ programs and operations. U.S. Federal Law Sources - Presented by American Law Sources On-Line (ALSO). Unified Agenda - The Unified Agenda (also known as the Semiannual Regulatory Agenda), published twice a year (usually in April and October) in the Federal Register (FR), summarizes the rules and proposed rules that each Federal agency expects to issue during the next six months. War Powers Resolution (50 U.S. Code Chapter 33) - Checks the president's power to launch military attacks. Also see Wikipedia backgrounder. Welfare Reform Act of 1996 (H.R.3734) - Text for the Personal Responsibility and Work Opportunity Reconciliation Act of 1996. This webpage last updated on Friday, September 15, 2017 1:50 PM.